Shaheed Bhai Ravinder Singh was born in village Shatrana, Amritsar. His parents were Giani Harbhajan Singh and Mata Gurnam Kaur. He was the youngest of six brothers. 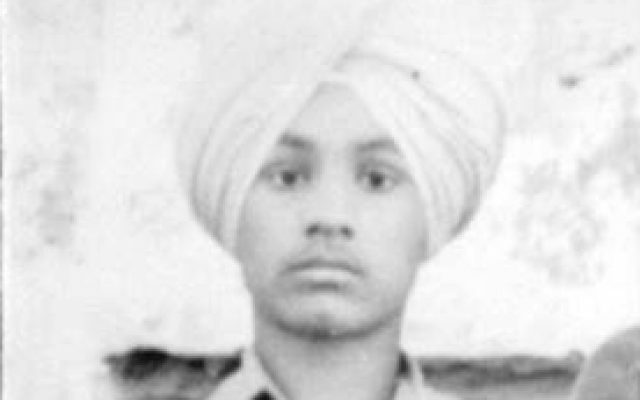 From birth, Bhai Sahib was raised in a Gursikh environment. His father, Giani Harbhajan Singh Ji was a close companion of Bhai Sahib Randhir Singh Ji. Bhai Ravinder Singh was given Amrit at a very early age and also kept bibek as a child. Bhai Ravinder Singh was not an ordinary child. He from an early age had dedication and love for Gursikhi and his family recalls that his bravery and courage were unparalleled. Once when he was just four or five years old, Bhai Ravinder Singh fell off a wall and broke his arm in two places. His father, Giani Harbhajan Singh said to him as he was being taken to have his arm set, “Puraatan Singhs would be cut apart, piece by piece but they would not even make a sound. You too should be brave like them.” The two reached the home of the person who set broken bones and showed him the arm. He said that because the bone was broken in two places, he would need to twist the bone back into place. Giani Ji had bought some grapes for little Ravinder Singh and told him that while his arm was being set, he could eat them. As the man twisted the boy’s arm, Ravinder Singh calmly ate the grapes and did not make a sound. When Bhai Ravinder Singh started school at Panjokhra Sahib, the local boys considered him and his cousins outsiders and were unfriendly. One day, a boy came to him at school and said, “Do you know what happened today? Someone slapped your cousin! He got slapped like THIS! !” and with this, he slapped Ravinder Singh across the face. Bhai Ravinder Singh pounced on the boy and began to beat him. The other local boys joined in the fight and thought there was strength in numbers. Bhai Ravinder Singh broke a branch off a nearby tree and chased the group of boys away. The Physical Education teacher was watching all this and called the young boy and patted him on the back and said he should be proud. He then called all the boys who had attacked Ravinder Singh together and punished them. He also asked them, “how is it possible that one boy chased all of you away? ?” After this day, everyone began to call Bhai Ravinder Singh “Jathedar”, just as Bhai Atma Singh had been doing from a very early age. Once, Bhai Ravinder Singh was on his tractor at night, coming from his fields when he saw someone run towards him with a sword. Ravinder Singh was still a young boy and it would have been natural for him to be afraid and run away, but he took a crow bar from the tractor and began to run towards the man with sword. When he came near, the man yelled, “No! Don’t hit me! It’s me! !” It was a drunk who said that his enemies were after him and he carried the sword to protect himself and he had mistaken Ravinder for one of them. Ravinder Singh came home and everyone was amazed at the young boy’s daring. After this, Bhai Ravinder Singh began to keep to himself more. He increased his nitnem and naam abhyaas. Before becoming a ‘Sipahi’, he would first become a ‘Sant’. He wanted to reach a stage where he would be confident that he could face torture and be able to withstand it. He wanted to be spiritually prepared for the battle ahead. Slowly, he made links with Singhs from Babbar Khalsa. The family home was raided in 1988 by the police and the next day, Bhai Sahib left home, never to return. His beard had still not grown in and the picture above is the final picture Bhai Sahib’s family had taken. Bhai Ravinder Singh made frequent trips to training camps in Pakistan and became a trusted member of the Jathebandi. Although he was young, everyone respected him and knew that his decisions were always firmly based on Gurmat. There was once a group meeting in which many senior Singhs were in attendance. Bhai Sahib was also present. The issue being discussed was how to fund the movement. Some suggested robbing banks and other means. Ravinder Singh rose after all had had their say and asked, “May I speak?” Although permission was granted, because he was the youngest person at the meeting, some Singhs did not think a youngster like him would have anything worthwhile to say. Bhai Ravinder Singh said, “We are all fugitives here, and our properties are useless to us. Why don’t we sell those first, to make money?” Everyone at the meeting was amazed at how Gurmat oriented and wise his suggestion was. In 1989, Bhai Ravinder Singh met one of his brothers. He was in chardi kala. His elder brother encouraged him to do as much naam abhyaas as possible. Bhai Sahib confided that with Guru Sahib’s kirpa, now whenever he woke up in the middle of the night, he noticed that he was either reciting bani or his naam khanda was going automatically. Bhai Ravinder Singh asked his brother to take him into town on the back of his bike. His brother recalls that although there were security forces all around, Bhai Sahib kept smiling and showed no sign of fear. After some time, Bhai Ravinder Singh rose to the high command of Babbar Khalsa. He was still very young and one well known area commander complained that it didn’t make sense that such a young man could be his senior. After some time however, that Singh too recognized Bhai Sahib’s qualities and began to respect him. Babbar Khalsa was organized in a manner by which the High Command was isolated and separated from the workers. So an area worker would not be familiar with the senior Singhs in the Jathebandi. This was the most wise arrangement in order to maintain secrecy and security. Bhai Ravinder Singh was given the duty of being an intermediatary between the High Command and local workers. He was thus in the sensitive position of knowing both levels. He supplied and distributed arms to the Singhs. Once, Bhai Sahib and a companion were taking arms to their companions. They performed and ardaas for the success of their mission and left. They had packed the guns and ammunition in a bundle of sugarcane and placed it on the back of their motorcycle. On the way, they saw that at a distance there was a major Police checkpoint (naka). The Singh accompanying Bhai Sahib suggested they turn around. Ravinder Singh replied that they had done ardaas and they should now have faith. The police motioned for the motorcycle to slow down. Bhai Ravinder Singh slowed the motorcycle’s speed, making it seem as though he was pulling over but all of a sudden he pressed the gas and drove through. The police opened fire and began to chase, but the Singhs entered the village streets and threw the police off their trail. Bhai Sahib had full faith that Guru Sahib would himself help them in their cause. On another occasion, Bhai Sahib and a companion were staying at a home in the Patiala area. It was Amrit vela and Bhai Sahib said that they should go to Gurdwara Dukh Nivaran Sahib for Darshan and listen to keertan. Bhai Sahib’s companion said that it was dangerous to go out and that they could listen to keertan on the radio. Ravinder Singh replied that it was better to go to Guru Sahib’s hazoori. As the two left, they saw that the village was going to be surrounded and searched by the security forces. The Singhs reached Dukh Nivaran Sahib and after paying obeisance, Bhai Ravinder Singh said he would right away return. The Singh with him asked, “first you were so eager to come, now why are you going back? You yourself saw that the village was being surrounded.” Bhai Sahib replied that if the police had come for them after being tipped off, and they were not there, the family they were staying with would be harassed, and so it was better to go back. Bhai Sahib returned and since the security forces were monitoring just those leaving the village, they did not take any notice of those entering. Bhai Sahib returned to the house. The search operation never reached the house he was staying at as it was one of the last and it was decided that it was not worth searching. Those families Bhai Ravinder Singh stayed with all say that he did not come and stay as a guest or issue orders, he became like a member of the family and even helped around the house. For a period of two months, Bhai Sahib was told to stay in Gurdaspur amongst the relatives of a Singh in the Babbar high command. The families were not Gursikhs and the men were drunks and gamblers. It was because of this that the families would not be suspected and could hide Bhai Ravinder Singh. It seemed like a difficult task for a Gursikh to stay in such an environment, but Bhai Sahib did not complain. He continued with his naam and bani and his humble personality drew everyone close to him. Bhai Ravinder Singh left such an impression on those that after he left, they arrived at the next Amrit Sanchaar on the back of tractor trolleys and all went to receive the gift of Amrit. The Singh in high command laughed that he had not been able to influence his relatives all his life and Bhai Ravinder Singh had transformed them in just two months. Bhai Sahib had access to the money of the Jathebandi and distributed it to families who needed help. Ravinder Singh was visiting one of his relatives once, when the relative commented that his family’s financial situation was quite stressed and that Singhs came to his home to eat and it would be nice if he too could receive some money. Bhai Sahib asked, “do you have flour?” The relative replied, “yes, of course” Bhai Sahib then said, “When Singhs come, make parshadas and serve them with salt. I can’t give you this money. It is dasvandh of other Singhs and eating it is poison. How can I give my own family poison?” Even though that Singh’s need was genuine, Bhai Ravinder Singh did not want anyone to think that he was giving the Jathebandi’s money to his own relatives for profit. While in the freedom movement, Bhai Sahib found it almost impossible to keep bibek. He began to eat at vegetarian restaurants. Once while eating, he found a bone in his food. Despite all risks, he appeared at the next Amrit Sanchaar for a peshee. He told the Punj Pyaaray what had happened but they replied that they would not give him Amrit again as he might repeat this mistake in the future. Since he could not keep bibek living such a lifestyle, what was the point of getting peshed they asked? Bhai Sahib became very emotional and one of the Singhs doing seva tells that he replied, “Death can come at any moment on the path I am walking. I don’t want to die without being forgiven. I cannot risk dying as a patit. Please forgive my mistake and I pledge that from now on, despite the difficulties, I will only eat food prepared by Amritdharis.” The Punj Pyaaray were moved and gave him Amrit once again. After this, Bhai Sahib was very strict and he would go hungry for days but only eat food prepared by Amritdharis. In Bhai Sahib’s final letter to his brothers, around 1991, he wrote that although he had joined the Sikh Movement for the liberation of the Panth, it was not as he had expected. He wrote that the Movement was not following Tat Gurmat and many leaders were breaking rehit. He advised his brothers that they should not follow in his footsteps unless their father gave them permission first. He continued that he was too far in to return and he was determined to be a Shaheed. He had the opportunity to escape, but he would not. Bhai Sahib’s family did not hear from him for quite some time. After some months, they sent word to the Babbar High Command to ask what had happened to their son. The reply they received was that while crossing the border with Bhai Gurdeep Singh Vakeel and a member of the Panthic Committee they had been sighted and in an encounter the two Singhs had been martyred but there was no word on Bhai Ravinder Singh. They said that they were quite sure that he too had died since there had been no word for some time now and if he had been caught, the organization would have faced at least some losses. Bhai Sahib was familiar with both High Command and the workers and since neither had suffered any losses, it was likely that he had not fallen into the Security Forces’ hands and had died in an encounter. They said that if he had been caught, being of such a young age, it was likely that he would have given some information since no one can bear the torture they inflict. The High Command Singhs said that Bhai Ravinder Singh was like a flower who blossomed only for a few days and though he had a short life, gave a fragrance that would never be forgotten. But, they said, he also had his faults. His family asked what faults those were, the Singhs replied, “First, we had told him that his picture had been given to the police and they could now identify him and that he should tie his beard to conceal his identity. He flatly refused to do this. Second, we asked him to carry a cyanide capsule in case he was captured but he also refused to do this. Finally, when crossing the border, he would never wait for our ‘all-clear’. He used to say that life and death are in Guru Sahib’s hands and when it was time for him to die, nothing could save him.” Bhai Sahib’s family remarked that these might be weakness for the High Command, but they were Gurmukh qualities for them. Months passed and a friend of the family who lived far away asked Giani Ji if he had heard from his son. Giani Ji remarked that the Babbars had told him that Ravinder Singh was likely Shaheed. The friend said that this was impossible since just a few weeks earlier, he had seen Ravinder Singh in police custody, being taken in a Gypsy (jeep). He said that he noticed a Singh with his face covered being taken in a vehicle and those with him were in plain clothes. The friend was also on the road and the Singh put his hands together and gave him a Fateh. He did not recognize this person at first, but caught up to the Gypsy again and motioned for the Singh to uncover his face. The Singh managed to do so and he recognized that it was Bhai Ravinder Singh. The Gypsy then sped up so it could not be followed and so the two could not see or speak to each other any further. It is now known that Bhai Ravinder Singh was wounded in the encounter at the border. He had gone to Delhi to seek treatment. Someone informed the police about his whereabouts and he was surrounded. Bhai Sahib had a pistol but when he tried to fire, it jammed. He was arrested. Bhai Sahib was severely tortured for days but did not reveal anything. If he had spoken, both the High Command and local workers would have been eliminated. After some time, the police decided to try a new tactic. They isolated him in a cell and did not bother him any further. Bhai Sahib lived like this for some time but then thought that it was not right for a Singh to live in such a manner. Either he should escape or become Shaheed while trying. He grabbed a prison guard’s gun and attempted to escape but was captured once again. This time, Bhai Sahib was again tortured savagely and his soul left his body for its eternal place in SachKhand.